Illustrations note 1 Illustrations, color; 33 Illustrations, black and white; XXIII, 412 p. 34 illus., 1 illus. in color. What's the point of calculating definite integrals since you can't possibly do them all? What makes doing the specific integrals in this book of value aren't the specific answers we'll obtain, but rather the methods we'll use in obtaining those answers; methods you can use for evaluating the integrals you will encounter in the future. This book is written in a light-hearted manner for students who have completed the first year of college or high school AP calculus, and have just a bit of exposure to the concept of a differential equation. Every result is fully derived. 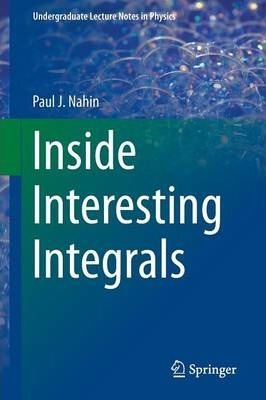 If you are fascinated by definite integrals, then this is a book for you. Preface.- 1. Introduction.- 1.1 The Riemann Integral.- 1.2 An Example of Riemann Integration.- 1.3 The Lebesgue Integral.- 1.4 `Interesting' and `Inside'.- 1.5 An Example of a Trick.- 1.6 Singularities.- 1.7 Dalzell's Integral.- 1.8 Where Integrals Come From.- 1.9 Last Words.- 1.10 Challenge Problems.- 2. `Easy' Integrals.- 2.1 Six `Easy' Warm-ups.- 2.2 A New Trick.- 2.3 Two Old Tricks, Plus a New One.- 2.4 Another Old Trick: Euler's Log-Sine Integral.- 2.5 Challenge Problems.- 3. Feynman's Favorite Trick.- 3.1 Leibniz's Formula.- 3.2 Dirichlet's Amazing Integral.- 3.3 Frullani's Integral.- 3.4 The Flip-Side of Feynman's Trick.- 3.5 Combining Two Tricks.- 3.6 Uhler's Integral and Symbolic Integration.- 3.7 The Probability Integral Revisited.- 3.8 Dini's Integral.- 3.9 Feynman's Favorite Trick Solves a Physics Equation .- 3.10 Challenge Problems.- 4. Gamma and Beta Function Integrals.- 4.1 Euler's Gamma Function.- 4.2 Wallis' Integral and the Beta Function.- 4.3 Double Integration Reversal.- 4.4 The Gamma Function Meets Physics.- 4.5 Challenge Problems.- 5. Using Power Series to Evaluate Integrals.- 5.1 Catalan's Constant.- 5.2 Power Series for the Log Function.- 5.3 Zeta Function Integrals.- 5.4 Euler's Constant and Related Integrals.- 5.5 Challenge Problems.- 6. Seven Not-So-Easy Integrals.- 6.1 Bernoulli's Integral .- 6.2 Ahmed's Integral.- 6.3 Coxeter's Integral.- 6.4 The Hardy-Schuster Optical Integral.- 6.5 The Watson/van Peype Triple Integrals.- 6.6 Elliptic Integrals in a Physical Problem.- 6.7 Challenge Problems.- 7. Using (-1) to Evaluate Integrals.- 7.1 Euler's Formula.- 7.2 The Fresnel Integrals.- 7.3 (3) and More Log-Sine Integrals .- 7.4 (2), At Last!.- 7.5 The Probability Integral Again.- 7.6 Beyond Dirichlet's Integral.- 7.7 Dirichlet Meets the Gamma Function.- 7.8 Fourier Transforms and Energy Integrals.- 7.9 `Weird' Integrals from Radio Engineering.- 7.10 Causality and Hilbert Transform Integrals.- 7.11 Challenge Problems.- 8. Contour Integration.- 8.1 Prelude.- 8.2 Line Integrals.- 8.3 Functions of a Complex Variable.- 8.4 The Cauchy-Riemann Equations and Analytic Functions.- 8.5 Green's Integral Theorem.- 8.6 Cauchy's First Integral Theorem.- 8.7 Cauchy's Second Integral Theorem.- 8.8 Singularities and the Residue Theorem.- 8.9 Integrals with Multi-valued Integrands.- 8.10 Challenge Problems.- 9. Epilogue.- 9.1 Riemann, Prime Numbers, and the Zeta Function.- 9.2 Deriving the Functional Equation for (s).- 9.3 Challenge Questions.- Solutions to the Challenge Problems.